Fate: sunk as a target (August 2007) as part of Operation Valiant Shield 2007 / Pacific. 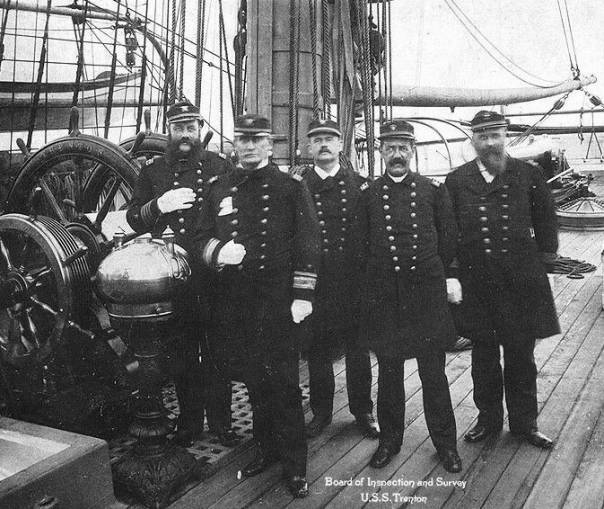 The Navy's Board of Inspection and Survey visits USS Trenton in 1886, probably soon after she returned from service in the Far East. Commander Henry C. Taylor; Chief Engineer Philip Inch; and Naval Constructor Philip Hichborn. U.S. Naval Historical Center Photograph. Rear Admiral James Edward Jouett (7 February 1826 – 30 September 1902) was an officer in the United States Navy during the Mexican-American War and the American Civil War. His father was Matthew Harris Jouett, a notable painter, and his grandfather was Revolutionary War hero Jack Jouett. 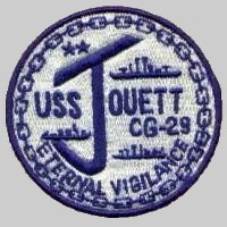 Born near Lexington, Kentucky, Jouett was appointed Midshipman 10 September 1841. He served on the African coast in Decatur with Matthew C. Perry and in John Adams during the Mexican-American War. At the beginning of the Civil War, Jouett was captured by Confederates at Pensacola, Florida but was soon paroled. He then joined the blockading forces off Galveston, Texas, distinguishing himself during the night of 7 to 8 November 1861 in the capture and destruction of Confederate schooner Royal Yacht, while serving on USS Santee. Jouett later commanded Montgomery and R. R. Cuyler on blockading duty and in September 1863 took command of Metacomet. In the Battle of Mobile Bay, 5 August 1864, his ship was lashed to Admiral David Farragut's flagship Hartford as the ships entered the bay. Monitor Tecumseh was sunk by an underwater "torpedo", but the ships steamed on, inspired by Farragut's famous command: "Damn the torpedoes! Four bells! Captain Drayton go ahead! Jouett full speed!" Metacomet was sent after two Confederate gunboats, and in a short chase Jouett riddled Gaines and captured Selma. Jouett had various commands ashore and afloat after the Civil War, taking command of the North Atlantic Squadron in 1884. In 1889 he commanded a naval force which forced the opening of the isthmus of Panama, threatened by insurrection. 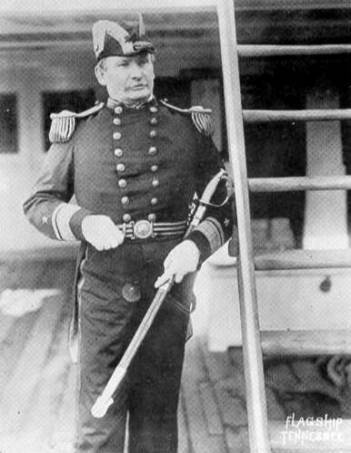 Admiral Jouett was named President of the Board of Inspection and Survey and served from June 1886 - February 1890. Rear Admiral Jouett retired in 1890 and lived for most of his remaining years at "The Anchorage," near Sandy Springs, Maryland. He died 30 September 1902. 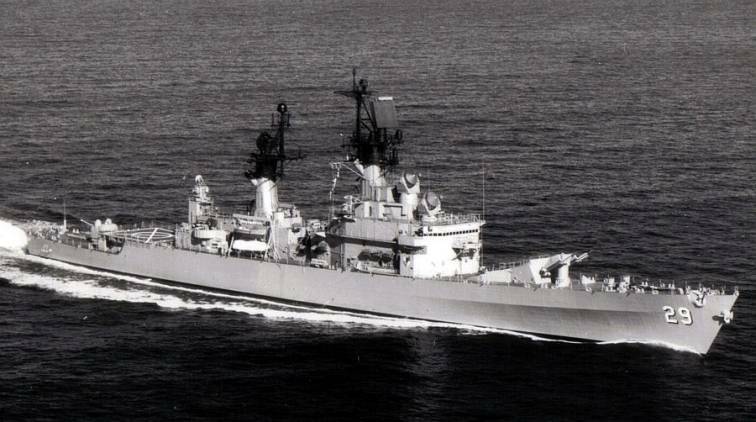 The third JOUETT (DLG-29/CG-29) was laid down 25 September 1962 by Puget Sound Naval Shipyard, Bremerton, Wash.; launched 30 June 1964; sponsored by Mrs. S. J. Ervin, Jr., wife of the Senator from North Carolina; and commissioned 3 December 1966, Captain Robert S. Hayes in command. Carrying the most modern antisubmarine detection and missile warfare gear, JOUETT joins the fleet as a ready defender of freedom. Her motto, "Eternal Vigilance," serves as a reminder of the ship's mission in war and peace. 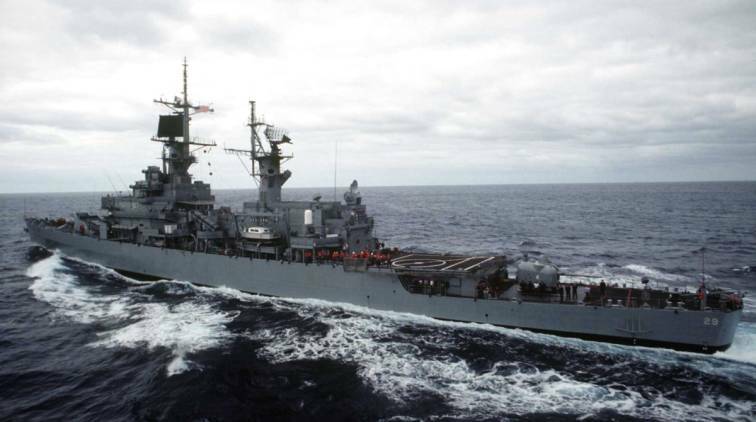 Upon completion of fitting out in February of 1967, JOUETT was assigned to Cruiser-Destroyer Force, U.S. Pacific Fleet, and operated out of her home Port, San Diego. 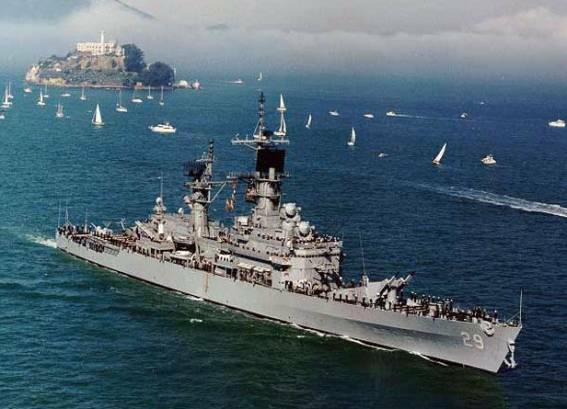 Reclassified as a guided missile cruiser, CG-29, on 30 June 1975, JOUETT was decommissioned and stricken from the Navy Register on 28 January 1994 at San Diego. Transferred 30 March the same year to the Maritime Administration, she was laid up at the Suisun Bay, CA. 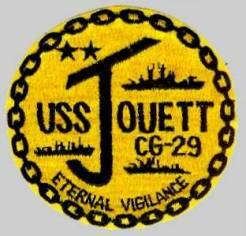 August 2007 / Jouett finally sunk as a target as part of Operation Valiant Shield 2007 (Pacific).